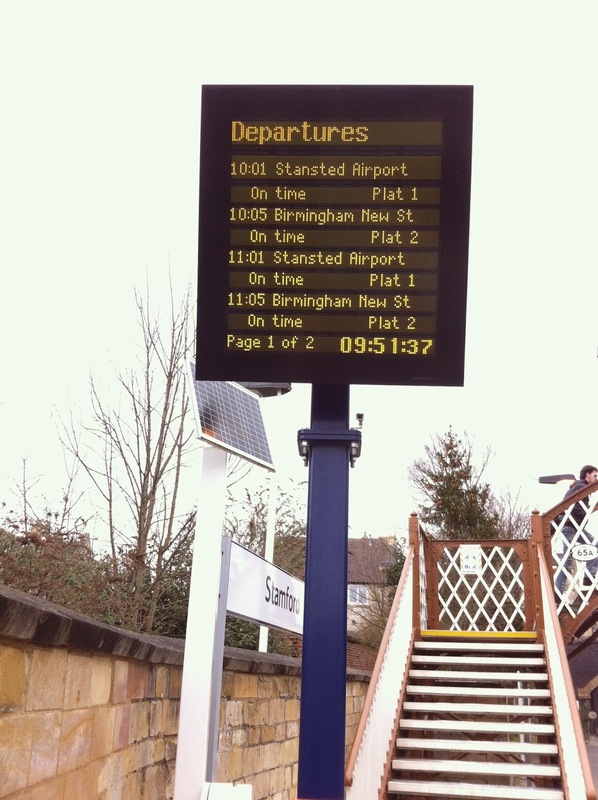 mwtrips - Mark's Rail Adventures: "A Little Application"
Modern information technology has enabled even small stations like Stamford to have real-time information displays on their platforms and train information announcements. No more do we wonder when the next train is supposed to be, whether it is on time or which platform we need. But it goes further than this: the same national real-time train information database can broadcast most of the same information straight into your own hand before you even leave for the station. The introduction of the smartphone has transformed the availability of real-time information for the traveller by train and by bus. We use Apple iPhones but similar facilities are available on Android and other smart devices for those who prefer them. There are many applications (apps) available which are designed to provide the information passengers need and even to sell, and store in memory, tickets for travel. I just want to look at a few of these which we have found particularly helpful. The first is CrossCountry Trains' Train Tickets app, which, as its name suggests, is designed to sell you tickets for their services. They make it easy to download and install the app by sending them a text message from the device on which you wish to install it - and instructions to that effect are shown on all their trains. Now, frankly, I have never found it much use for this purpose (I buy all my tickets via East Coast anyway, to get the loyalty points!) because its built-in search engine does not find all the trains available for the journey, to the extent that it found me nothing suitable for getting from Stamford to Alfreton (blog, 11 November 2013) and it is not easy to see how to book tickets for both directions. However, it is absolutely brilliant at supplying live train times, both arrivals and departures, for all train companies to and from all stations, quickly and accurately listing all the departures or arrivals at the nearest station or at a station chosen from the national list. I use it before I leave for the station to ensure that my train is running and I use it when on the train if I have a connection to make, especially when trying to make an unofficial, tight connection and I need to know if my train is a minute or two late and which platform I need to get the next one! It gives the history of the train's stops so far and predicts the likely timeliness for the rest of its journey, invaluable in case of problems but pretty handy all the time. It is free of charge, and if you only ever use it for live train times it is well worth having. For journey planning I normally use my desktop or laptop computer but if I need to plan a journey while out and about then I use East Coast's app Trains Live which even includes a "Get me home" function which finds the next train service from wherever you happen to be to the place you have programmed it to know is your home station! It also includes an Underground map, so if you live in or visit London this is a handy little extra. Again it has a Live Departures and Arrivals but this does not seem to include all the stations: it is not as picky with stations as the CrossCountry version is with trains and does work well with the company's own stations, but for general use the CrossCountry app is better for live train times. Mapping apps which are generally included with smartphones can be used to follow your journey more or less accurately, depending upon 3G coverage (for they struggle with "seeing" GPS satellites from inside a train), but they do eat battery charge so this is early only satisfactory if you are on a train where your phone can be plugged in. We have bought two other apps for mapping. One is UK Maps which covers the UK in road atlas style and allows selective download of detailed OS style and street atlas style maps of areas we now we're going to visit. These take up a lot of memory so we plan which ones we need and ensure that unnecessary ones are deleted after a trip - all downloading best done via wifi at home rather than eating into our included 3G data allowance. In the UK and abroad we also use CityMaps2Go which similarly allows downloading of maps of places across the world, not just in cities, although this is where is comes into its own with links to all sorts extra data. getting off the train at Gare de Lyon in Paris we navigated our way to our hotel using this app, having downloaded the Paris street map and "pinned" the hotel location on it before we left home. Theoretically Apple Maps would have done this, too, and even given turn-by-turn instructions, but CityMaps2Go gives a much more readable map more in tune with the pedestrian's needs than Apple Maps which seems to be aimed at the motorist. It is like having an A to Z atlas of every city we are ever likely to visit. Finally, buses! There are bus apps specifically for London and I'll probably review those for a future post about travel in London: for now I want to look at NextBuses which works all over the country, even in Stamford. It finds nearby bus stops and lists the next few departures from them. It does help if you have a rudimentary idea of local geography and where you want to go, but it does mean that you do not have know where all the bus stops are and which buses stop at them, and you do not need to have the timetables in your head. I have used it to great effect in Peterborough, a lot slicker (and cheaper) than sending a text message to get the next departures, but again it does rely on having a data connection, usually meaning 3G when out and about. Via Nuneaton, or via London?